Build the best wind blade using only cardboard, paper and wooden dowels. 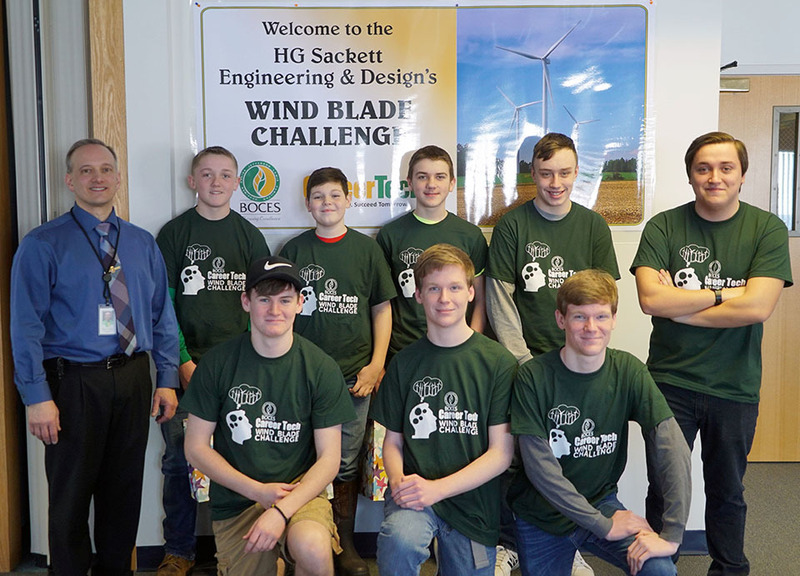 That was the challenge that faced students in the annual Wind Blade Challenge, an event hosted by the Engineering & Design program at the Howard G. Sackett Technical Center on March 8, 2019. The competition was open to students in grades 6-9. Four teams from Lowville Academy and Copenhagen Central took part. The students were tasked with building the best homemade wind blades which would be tested against each other. One testing station determined how much voltage the blades were able to produce while the second measured how fast the blades were able to lift a weight. Both tests involved placing the blades in front of a moving fan set at a predetermined speed. The competing teams were given two chances at each testing station, allowing them the opportunity to make improvements to their blades after the first series of tests and a chance to better their final score. Each testing area was manned by students in the Engineering and Design program. Once the testing was completed, the scores were compiled, giving the win to “The Storm” from Copenhagen. Competing on that team were 7th graders Casey Powis, Landon Sullivan, Caleb Gray and Clay Voght. All were competing in the event for the first time. The winning team were each given drones to take home while each participant was given an event t-shirt, courtesy of Avangrid Renewables, one of the big sponsors of the annual competition. Each participant in the competition was also invited to enroll in Engineering & Design offered to students beginning in their junior year of high school at the brand new Lewis County Jefferson Community College Education Center in Lowville, as well as take part in the annual M.A.S.T Summer Camp that will take place later this year at the Sackett Center. Click here to view the WWNY-TV report on the Wind Blade Challenge. Click here to view the Journal & Republican article. Visit our Facebook page for additional photos.